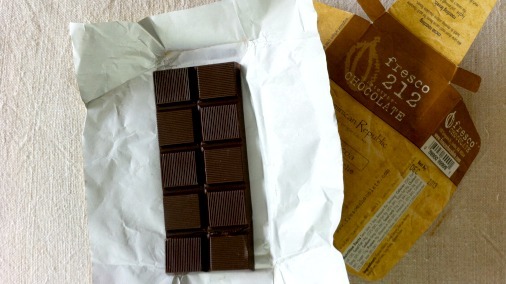 The bean to bar artisan chocolate maker took time out from the roast and conch to answer my questions. Cat Black: Tell me about your life before chocolate, what is your professional background? Rob Anderson: I am originally from the Southern coast of California and spent most of my youth at the beach. I attended University where I studied Physics and Electrical Engineering then later Computer Science. Several years were spent working as an Engineer, then a Manager and finally an Executive Director in a multi-national electronics company with a bit of business school in the mix. RA: I have always loved chocolate. As a youth I discovered the European chocolate product Toblerone and realized there was something better than Hershey and Mars. In 2005 while on a business trip to San Francisco I took a tour of the nearby Scharffen Berger chocolate factory. The smell of roasting cocoa made me determined to make chocolate at home. 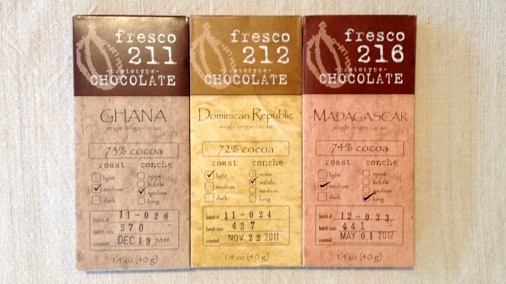 After a few years of experimenting and making a lot of very bad chocolate, Fresco was born in 2010. CB: Tell me a bit about how you make your chocolate? RA: I enjoy the creative aspect of chocolate making. With my engineering background and the help of friends with metalwork experience I took great pleasure in designing and developing my own roaster, winnower and conch. With a combination of this homemade equipment and some commercial equipment I create unique recipes for each new cacao we acquire. I enjoy experimenting with different cocoa roasting levels and different conching levels to bring out different flavour profiles from each batch. When we find a combination of cocoa bean, roasting level and conch level we like, that combination becomes a new recipe for commercial sale. We print the roast and conch information on our packaging so people know how we ended up with each bar. 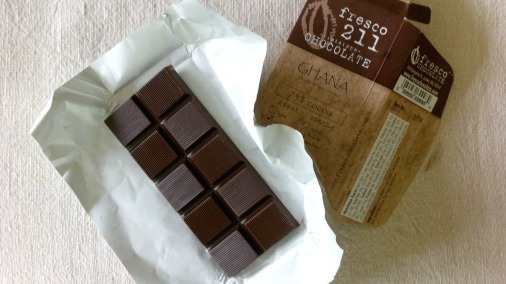 Ghana Chocolate with the trademark detailed wrapper. CB: It is a great challenge to make chocolate bean-to-bar, it must have been a steep learning curve for you. What have been some of your greatest discoveries? * Realizing that I couldn’t “process away” bad flavour notes from really bad cocoa. If the beans are bad, don’t bother trying to fix them. * Solid / cold cocoa butter is as good as glue, especially when trying to start up a chocolate machine that is cold. Whenever designing a machine that will process chocolate, every moving part needs a separate mechanism to warm it up first and melt the left over cocoa butter. * I really dislike tempering. CB: You have won many awards, congratulations! What do you feel is your greatest achievement? RA: Having fun! I didn’t start Fresco to win awards or sell lots of chocolate, although those things are a nice benefit, they are not my main purpose. The business world I come from is high stress and very competitive. Making chocolate is relaxing, it’s my escape from stress. I love chocolate and the happiness it creates in people. I love making chocolate at 2am when most people sleep. I love hiring family and friends to clean beans or mold and wrap bars so they can enjoy an income while doing something they like – this includes sampling lots of broken bars, they seem to break more as needed. CB: How have you seen consumer and food professional attitudes change towards fine chocolate since you started? RA: There is an entire artisan chocolate sub-culture that did not exist 10 years ago. The general population is still mostly unaware of fine chocolate but this is slowly changing. CB: How do you think the chocolate market is going to develop going forward? RA: Artisan chocolate makers will emerge around the word, much like micro-breweries and coffee roasters are present in many areas. We’ll see more specialty combination shops appearing around the globe in foodie oriented communities. A great example is a small shop in Seattle Washington called Wine-Tea-Chocolate. They have a great selection of items per their name as well as live music many nights and weekends. These types of shops are and will increasingly become social hubs offering alternatives to less savoury bars or pubs. Dominican Republic single origin bar. RA: Not at all. Growing up I lived on American fast food and bad home cooking. I discovered in my early adult years there was more to food than “heat at 350 for 20 minutes”. I’m regularly finding new undiscovered foods I like. I’m into balsamic fig flavours – this week. CB: Has your own palate and feelings about chocolate changed since you started? RA: Absolutely! You cannot help but evolve if you’re regularly tasting new chocolate creations and trying to discern flavour profiles that are often subtle. 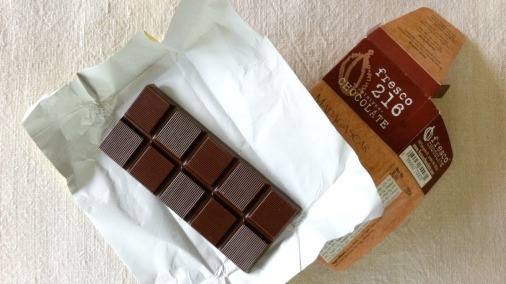 CB: What is coming next for Fresco chocolate? What plans do you have for the chocolate and for your business? RA: The soul and character of hand-made artisan chocolate is lost when chocolate transitions from small batch processing to continuous flow production. My Fresco growth plan includes specific technologies and processes that allow the chocolate to maintain its artisan character while still enabling larger production volumes. More to come later. CB: What is your desert island chocolate or chocolate recipe? RA: That is difficult because I don’t have just one specific chocolate I would want to live with. I suppose a chocolate recipe would have to include mascarpone and a chocolate blend with beans from Vanuatu and Trinidad Gran Couva.